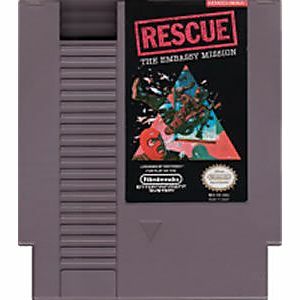 Rescue original NES Nintendo Game cartridge only - Cleaned Tested and Guaranteed to Work! I love this game as it is one of the most under rates titles ever. The game came in great condition and I received it in a timely manner. 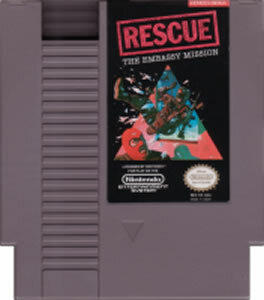 Unique Nes title. Terrorists have taken over an embassy. You must get your agents into sniping position while avoiding spotlights. Then use your snipers to shoot terrorists that walk past windows. 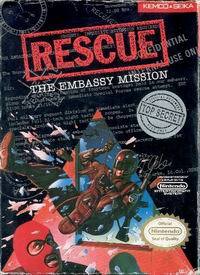 Finally break into the the embassy and rescue hostages. A short game overall but a great one! Cart arrived in Ireland just 11 days after ordering and is in excellent condition. I actually acquired the 'complete' version of this very fine game from LG, and it arrived in superb condition! This certainly is quite an intriguing, absorbing game, that a gamer no doubt will immerse him/herself in.